These look exactly like the ones I ate last night. How do you get the colours so strong? This is great! I love the way you scattered the jellybeans around, and invite my eye to travel through the painting. Nicely done! I am always so impressed with the way you get the shine on things!! 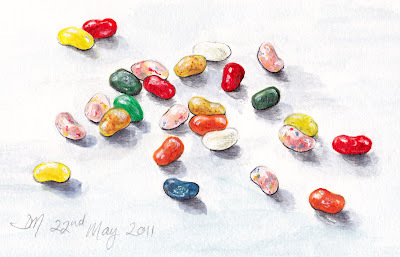 Lovely sketch...did you eat them? This is great on so many levels - it is almost an abstract. I love the composition, the arrangement of colors, and as always you make them seem like they are just a reach away! You are an amazing painter.